Experience Personalized Care – We’re Here to Help! Watch Dr. Kris Dorken in action at his video series The Making of Orthotics. 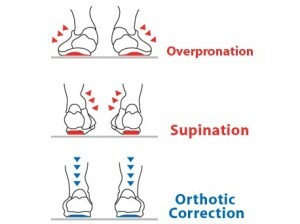 An ORTHOTIC is a foot-supporting device also known as a custom insole. Orthotics are custom-made devices to give support to the feet, plantar fascia fibrous band, ligaments and tendons. Foot Orthotics are used to correct imbalances in overall posture and walking patterns and to relieve pain from muscles and tendons in the feet all the way up through the ankles, knees, legs, hips and lower back. If you experience foot pain, this could be from poor biomechanics in the foot. Core Wellness Centre provides custom-made orthoses to ensure proper posture, walking and eliminate further pain, soft tissue buildup or numbness. Common Foot Problems: do you have these ailments? How Much Are Custom Made Orthotics? At Core Wellness Centre in Toronto, ask Dr. Kris about using your extended Health Care Insurance. To make it easier for you, we offer direct billing and online billing and facilitate claims for you. Low arched, or flat feet, are a common type of foot structure. Sharp pain, aching or stiffness on the bottom of one or both heels is a very common ailment. Pain from Plantar Fasciitis is often at its worst upon awakening in the morning (or after sitting down for an extended period and then resuming activity). This pain causes hobbling or a limping gait pattern for a few minutes before a comfortable stride can be resumed. As weight continues to be applied during walking or standing, mild or severe pain may persist. Another cause of heel pain is bone spurs, where bone growth originates from the heel bone (Calcaneous) and pinches into the tendons of the heel from the Achilles tendon. Injury, overuse, loss of fat pad and/or non-presence of fat tissue on the heel can also cause heel pain. A common deformity of the big toe joint, a bunion occurs mostly in people who have flat feet or who wear tight fitting footwear that are too small for their dynamic foot size. Women are more frequently affected with bunions because of tight, pointed, confining or high heeled shoes. Wearing high heels is especially stressful on the joints of the foot because all of the body’s weight rests on the ball of the foot; the foot is then forced into a narrow, pointed toe box, compounding the problem. Older people are also vulnerable to bunions because of the higher incidence of arthritis affecting the big toe joint. Core Wellness Centre offers professional pedorthist services and orthotics for adults and children. We are a fully encompassing rehabilitation centre located in Mid-town Toronto, and offer physiotherapy treatment if you have suffered an injury. We are located near St. Clair West subway station at 538 St. Clair Ave West. Parking available in rear. Our custom orthotics Toronto foot care clinic will manufacture your orthotics based to specifications so that together we can ensure they are the perfect fit. Call (416) 479 – 8311 today to schedule your appointment.